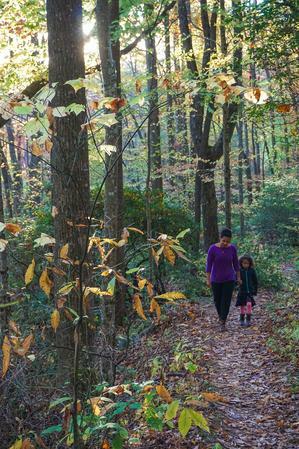 For those days when you're short on time, but still looking to get outside, a short hike near the city of Asheville might be a good option to fulfill the need to put boots to dirt. 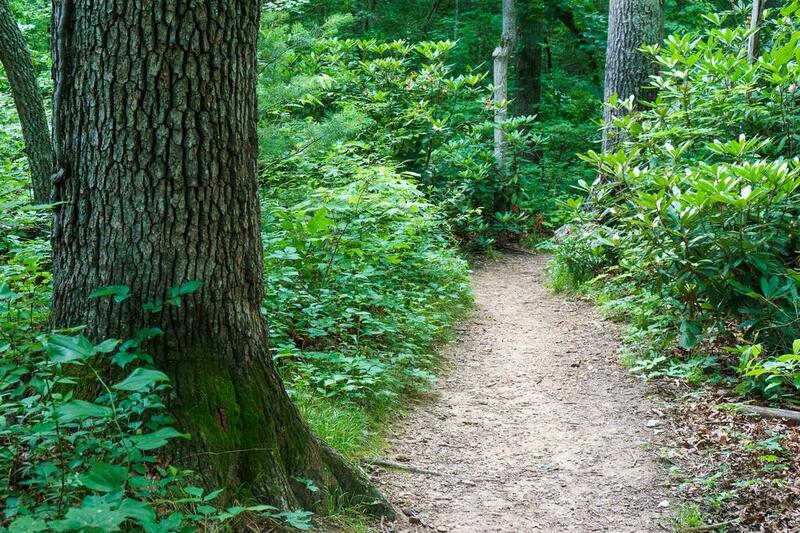 Within a 30 minute drive of the city of Asheville via the Blue Ridge Parkway, a number of sections of North Carolina's Mountains to Sea Trail fit the bill just perfectly. 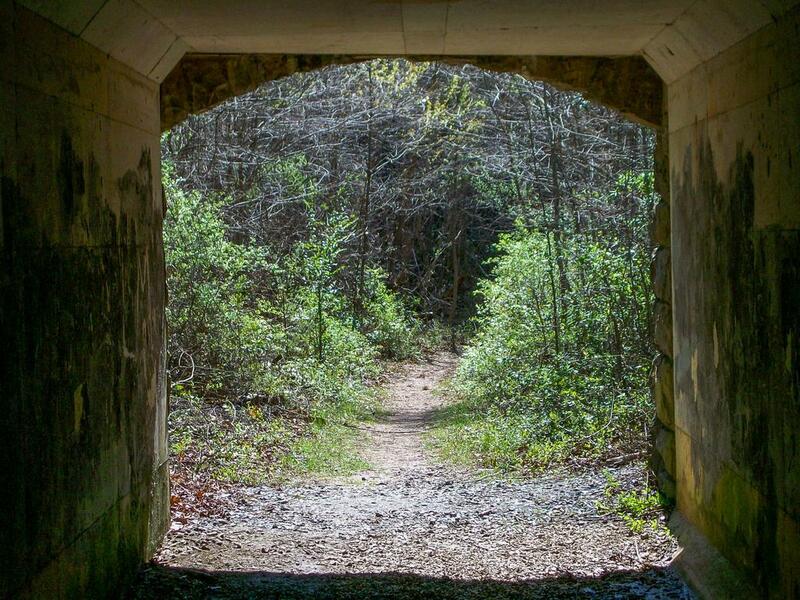 And while the trail spans the entire state, short segments of the trail along the Parkway are great for exercise walks, day hikes with children, or quick stress relieving strolls after work or on holidays when a full day outing doesn't fit the schedule. 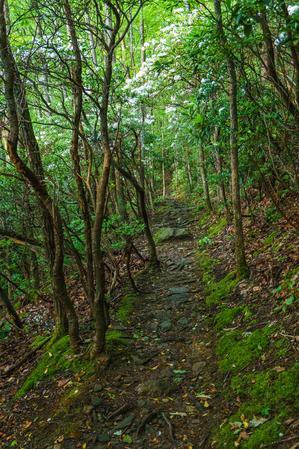 The Mountains to Sea Trail follows the Blue Ridge Parkway right through town, from Mount Pisgah in the South to Craggy Gardens in the North. 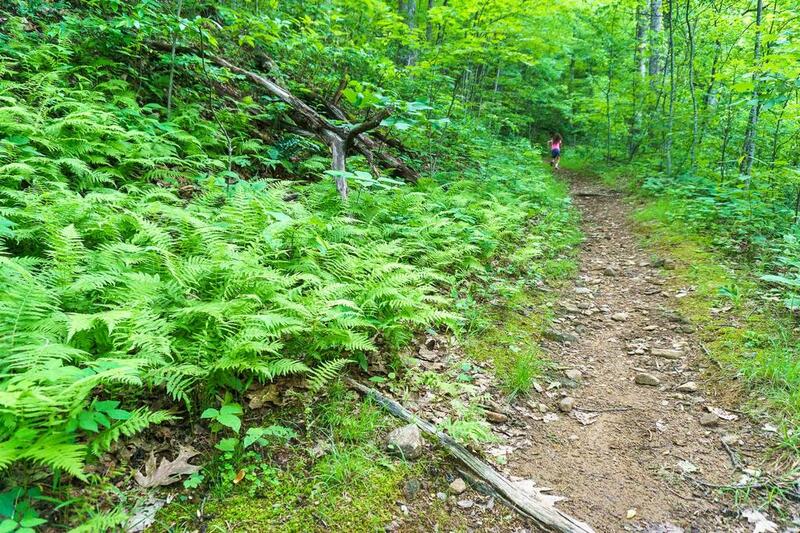 Most of these hikes are out-and-back, so you can take the whole segment described below, or simply walk 'till you're done and then return to your car! 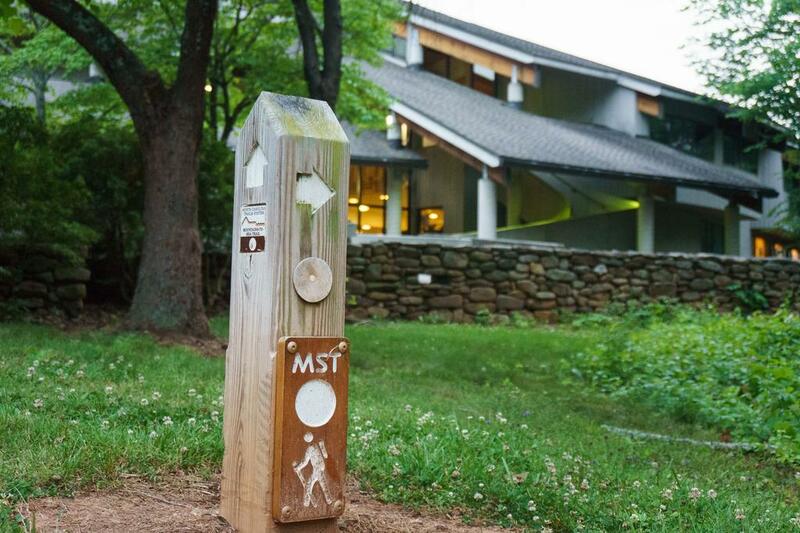 We'll use the Blue Ridge Parkway Visitor Center at US 74A, Milepost 384, when referring to the distance "North" or "South" of Asheville in these hikes' starting points. That's the quickest way onto the Parkway from downtown Asheville. 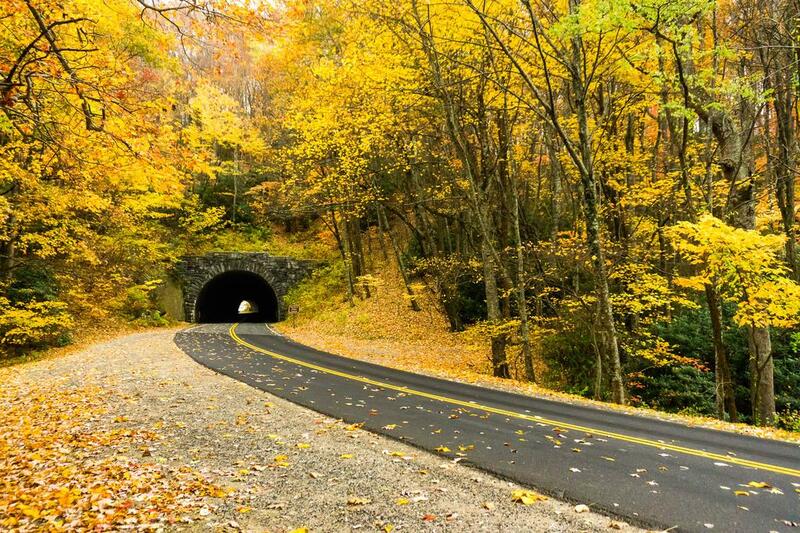 You can also take Town Mountain Road (NC 694) for a more scenic, curvy route or Tunnel Road (US 70) if you don't mind a few stoplights. 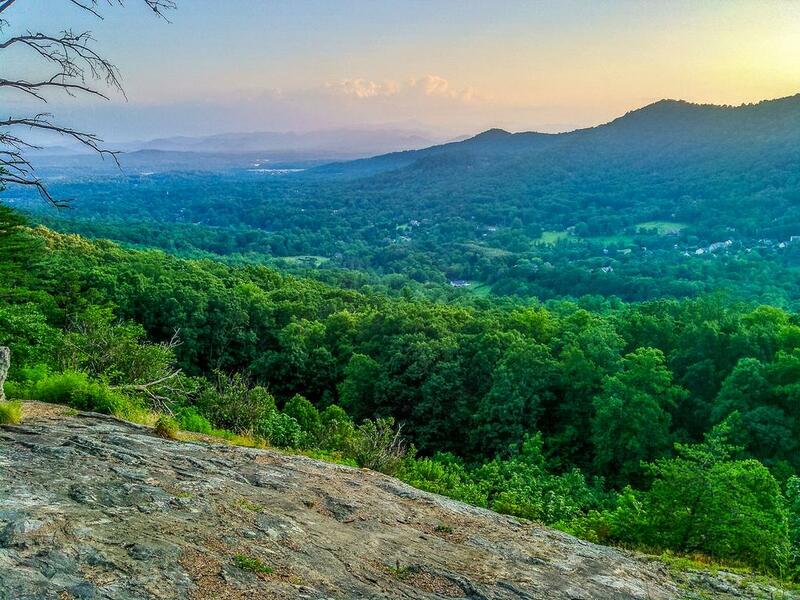 From South Asheville or Biltmore Village, you can use Hendersonville Road (US 25 South) and if you're in West Asheville use Brevard Road past the Asheville Outlets Mall (NC 191 South). You'll have to adjust the directions given below if using one of those routes. 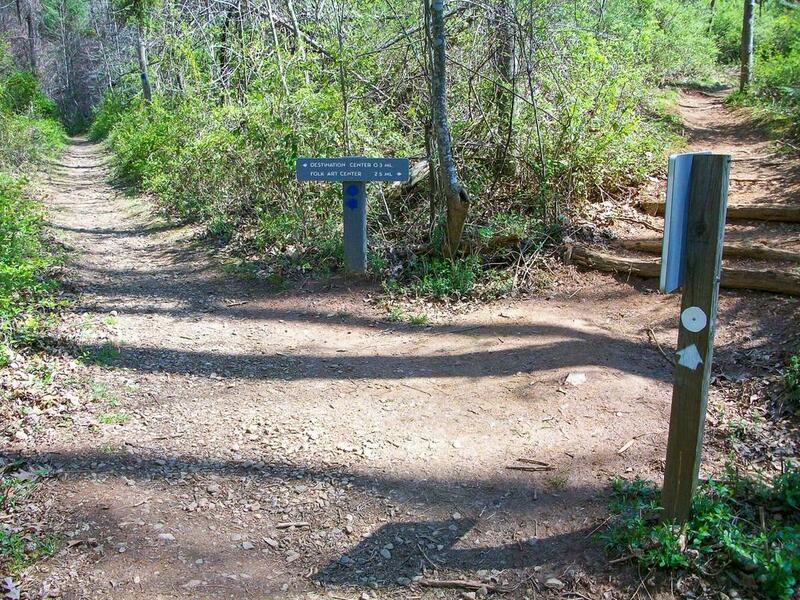 The Mountains to Sea Trail travels along the east side of the Blue Ridge Parkway, while a spur loop crosses to the west side and up to the new Visitor Center. 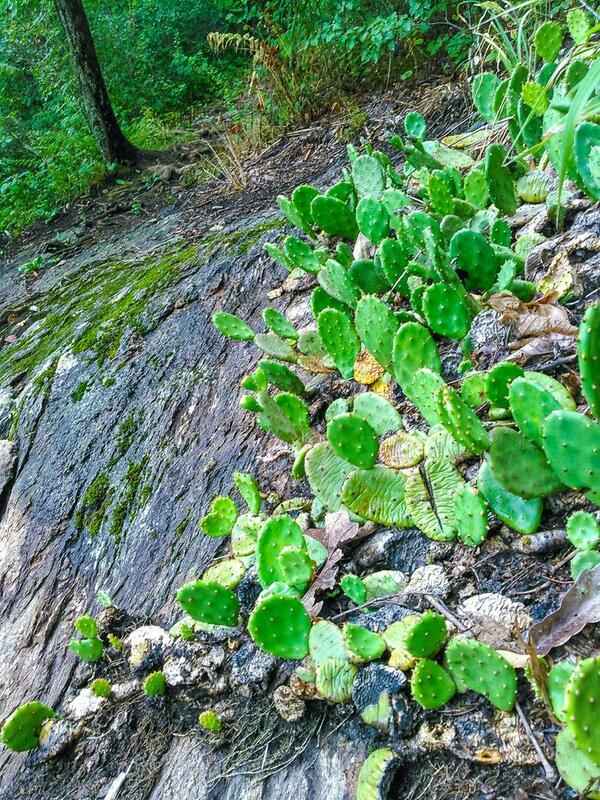 An excellent short hike combines these into a loop. It's a great leg stretcher, or even as a first venture into the woods for the younger ones. 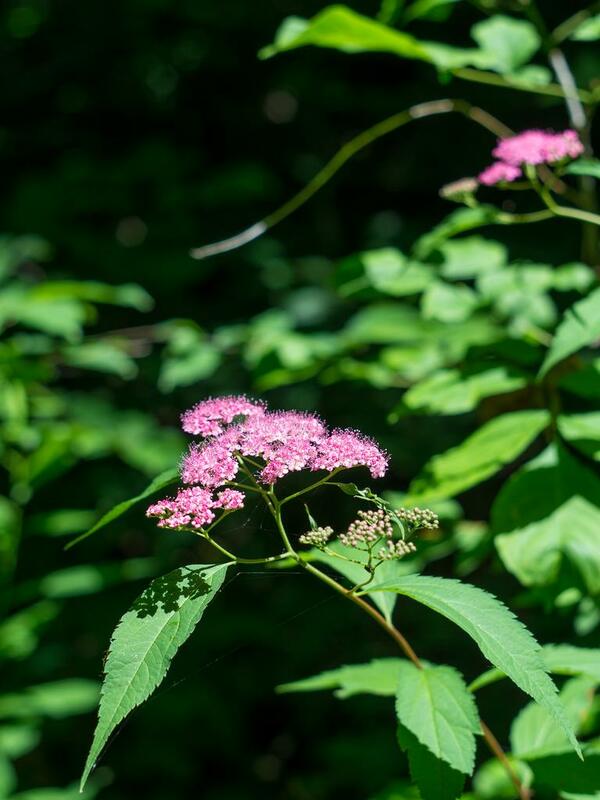 You're never too far from the road and never too far from the parking area, but it gives you a chance to get out and see a recovering second-growth forest at various stages of succession. There's also a neat tunnel under the Parkway that the kids will enjoy. 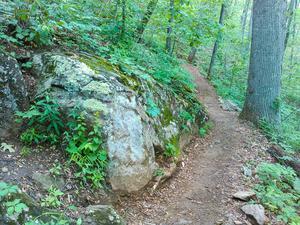 The surface is mostly smooth, with only a few sections with rocks, roots, or log steps. 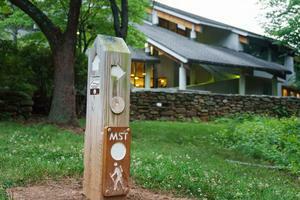 The trailhead is at the far end of the Visitor Center parking lot. 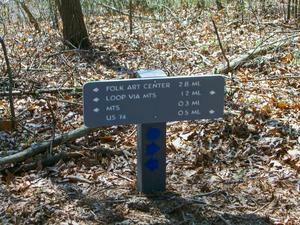 There is a sign at the start of the trail and all intersections are well signed. The Visitor Center is the highest point on the loop, so it'll be half downhill and half uphill (but neither steep nor a high elevation change). 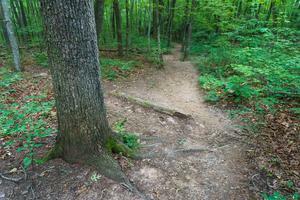 Turn left and go clockwise for a more gradual descent, or turn right and go counterclockwise for a more gradual climb. 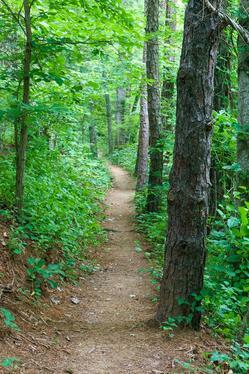 This short section of trail is well-maintained and heavily used, located just outside the city limits. Park at the Folk Art Center, just North of US 70 (Tunnel Road). You can also park at the Tunnel Road intersection if the Parkway is closed, so this hike is do-able in the snow. 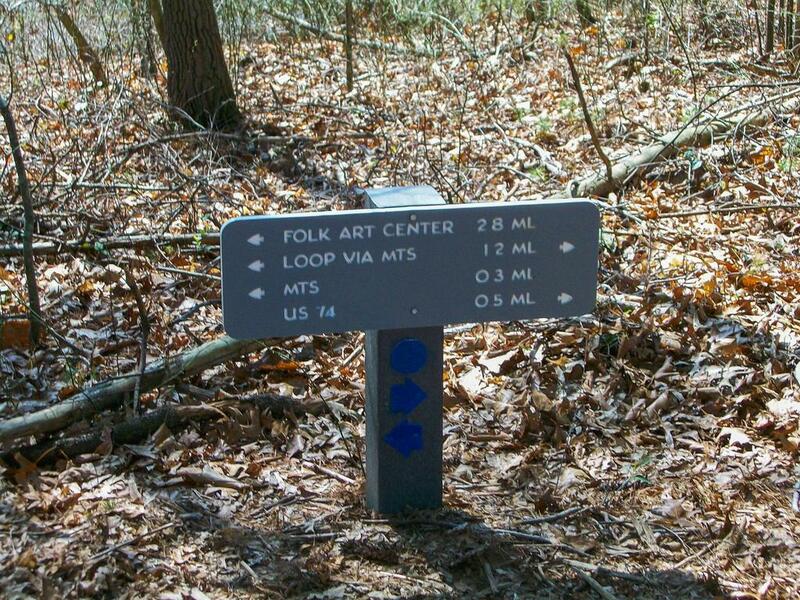 Follow the Mountains to Sea Trail/Nature Trail north past the Folk Art Center building. Bear right off the Nature Trail onto the Mountains to Sea Trail and cross the bridge over Riceville Rd. in about 0.2 mi. The trail then begins a climb, going up a steep but short hill. 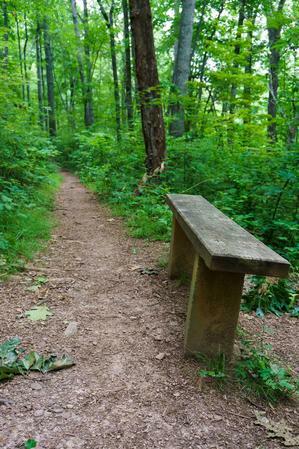 The trail travels past some impressively large trees in a mixed low-elevation hardwood and pine forest, and there are resting benches in places as the trail begins undulating up and down. It's mostly dry, so this hike is also doable soon after rain. After a climb of about 200 ft, you'll reach the summit of a low, rounded knob called "Bull Mountain" about 0.7 mi past Riceville Road. 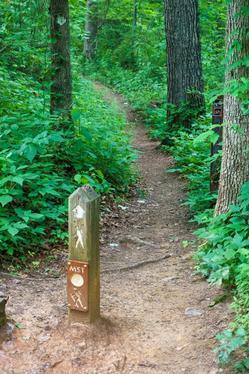 250 ft back downhill beyond the high point, the trail crosses the Parkway. Return via the same path, or you can return via the Parkway itself if it is closed. Loop return option: start heading back downhill on the Mountains to Sea Trail over Bull Mountain, then look to the right for an obvious side path leading uphill. 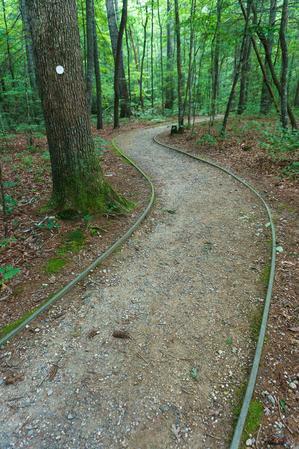 This steep, but very short connector comes out on a grassy road near the Parkway's shooting range. (Keep out). Turn left here, and left again at the next junction. The old road (which still has pavement underneath layers of leaves and dirt in places) winds around down past an old water tank to reach Bull Mountain Road at a gate. Take a left at the gate, then follow the boulders to a very short path on the left which connects back to the Mountains to Sea Trail. A right turn will then take you back across Riceville Road and to the Folk Art Center. If you're looking to get a bit more exercise by climbing some more significant hills, this segment might be for you. 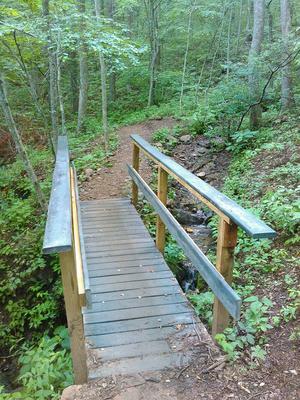 From the Parkway crossing, take the trail north across the little log bridge over the ditch and begin uphill. 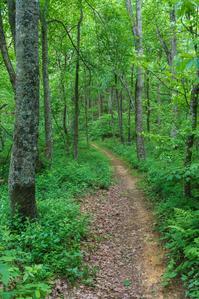 This area has a lot of poison ivy, so use caution during the growing season. 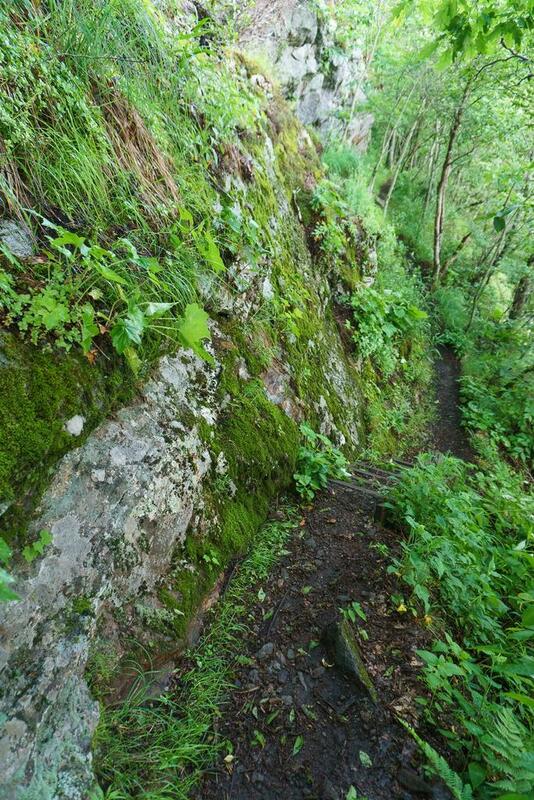 The trail follows the ridgeline or the slope just off to the side of it in places for the next 1.7 mi. 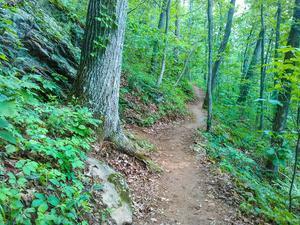 It passes through a forest much the same as the Bull Mountain segment. 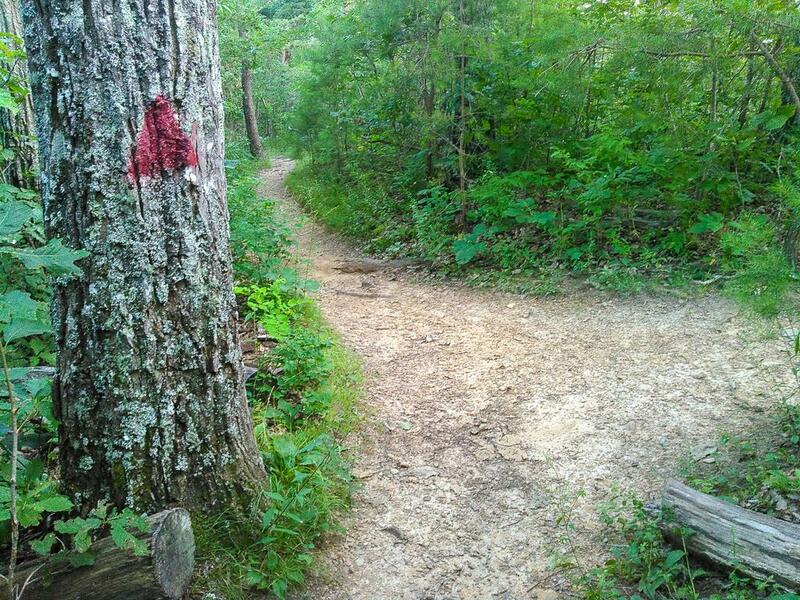 A red-blazed path leads to the left to a rock outcrop above the Haw Creek Valley overlook, providing a spectacular view of eponymous valley and to Mount Pisgah beyond. Use caution if you go out on the rock areas. 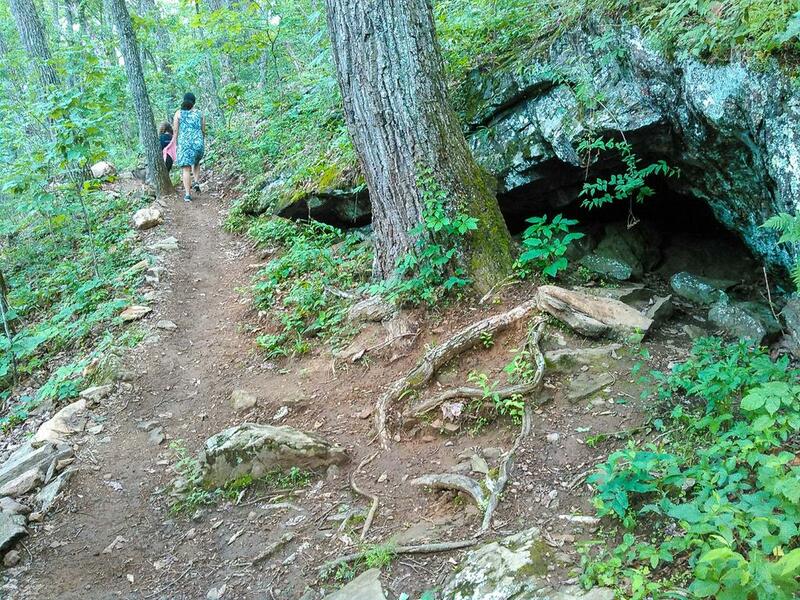 From the Parkway crossing, it's about 1.4 mi round-trip to a neat rocky area, 1.6 mi round-trip to a prominent low point beside the Parkway, 2.6 mi round-trip to the rock outcrop above the Haw Creek Valley overlook, and 3.2 mi round-trip to the top of an unnamed 3200+ ft knob above the Grassy Branch valley. The trail from Craven Gap makes a nice hike in both the southerly and northerly directions. 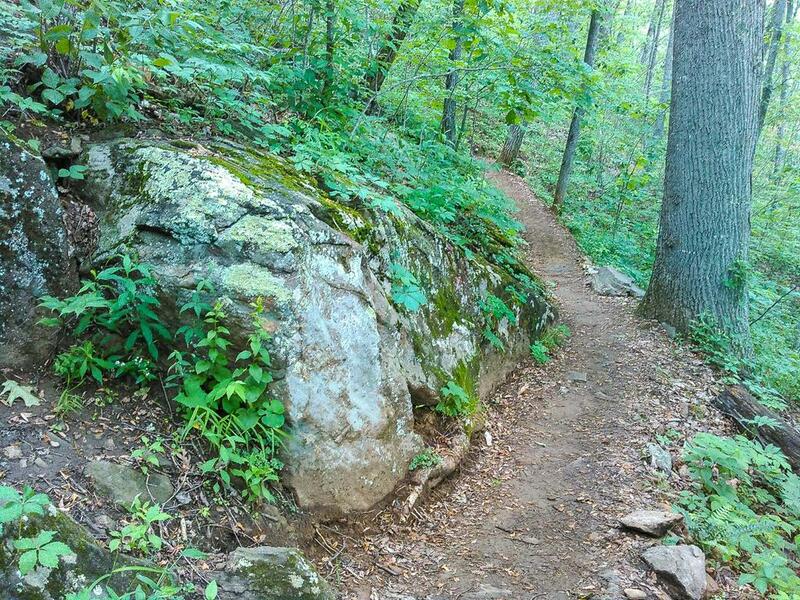 This segment of the trail is a bit higher in elevation, meaning temperatures will be noticeably cooler than in Asheville - which is nice during the summer. A parking pulloff beside the end of Town Mountain Road in Craven Gap is a good place to access the trail, and is reachable via Town Mountain Road or Webb Cove Road even if the Parkway is closed due to snow. Return via the same trail or the Parkway if it is closed. 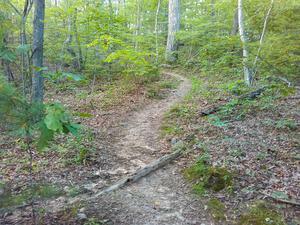 The trail is mostly level, with a few ups-and-downs, as it passes through a nice forest. 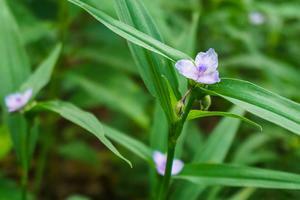 It's right below the Blue Ridge Parkway for most of its length, and crosses the headwaters of a couple of small streams. 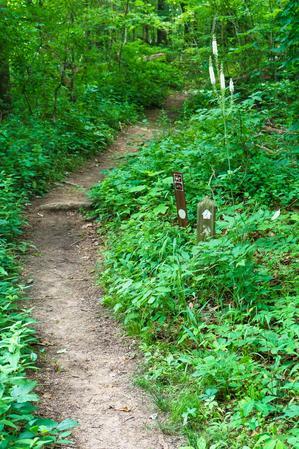 The trail follows an old road bed in places, which appears to be part of the old wagon road to Rattlesnake Lodge based on old maps of the area. It then leaves the road and begins a more significant climb over rocky terrain toward an unnamed summit above the Grassy Creek valley, which makes a nice stopping point. From Craven Gap, take one of the two blue-blazed connector trails to reach the white-blazed MST in just a few yards. The trail starts uphill in this direction but soon levels out. 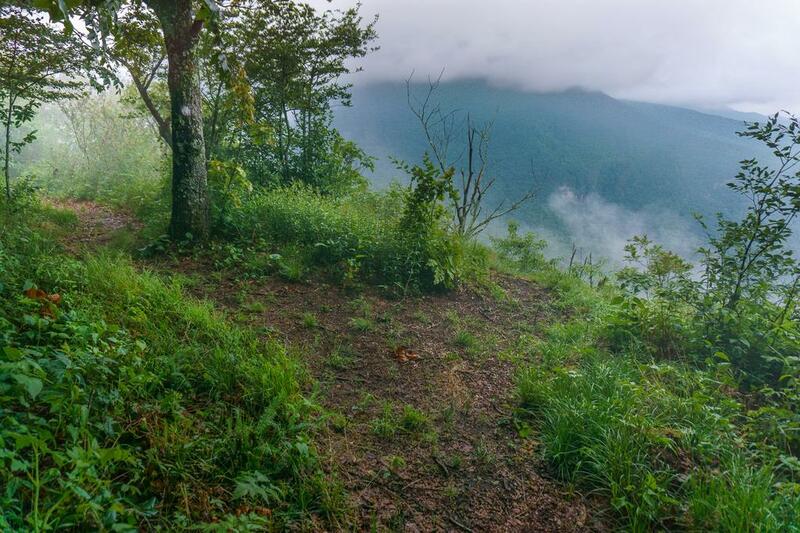 There is no significant overall elevation gain all the way to Ox Creek Road, but there are some nice up-and-down sections to get your blood pumping. This is a well-designed and maintained section of the trail. Good turn-around points include the ridge leading down from Rice Knob (marked by a rocky spine, where the trail starts going more steeply downhill), the rock outcrop with Prickly Pear growing on it, the bridge at the creek just beyond that, or Ox Creek Road. 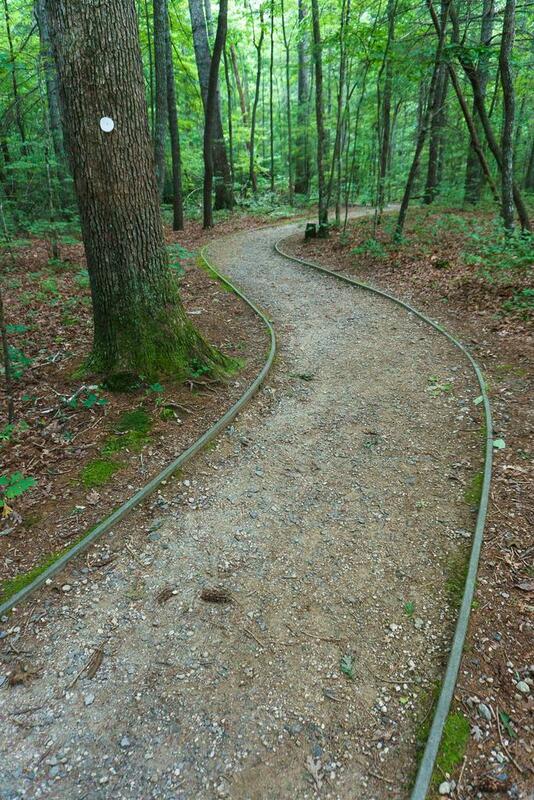 This is the section of trail that President Obama and the First Lady hiked on their vacation to Asheville on April 24, 2010! 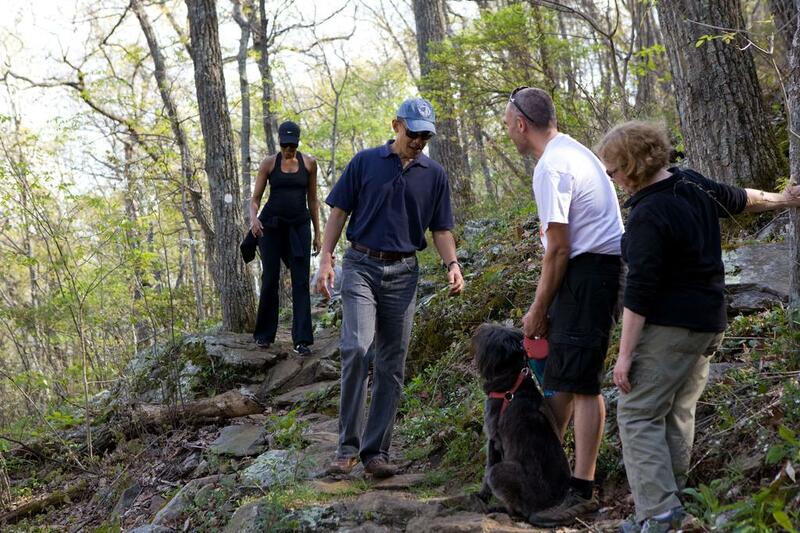 The Obamas hiking the Mountains to Sea trail near Craven Gap on their visit in April 2010. The trail is dry to start out; it becomes wetter toward Ox Creek Road with a few small creek crossings. Along this stretch, there are some limited views High Swan and Rocky Knob (thanks to hurricanes Frances and Ivan). 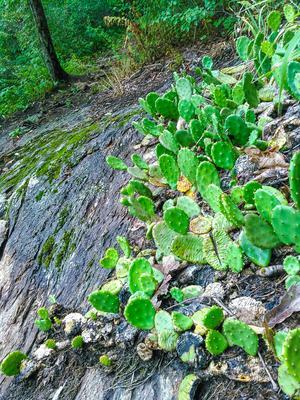 You'll also find some large trees, a small rock cave, a small rock outcropping that is just covered in wildflowers at the right time of year, wild mountain mint, and even some prickly pear cactus! 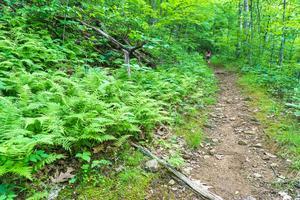 This segment of the trail is so great, we've made it one of the Best Hikes on this site. 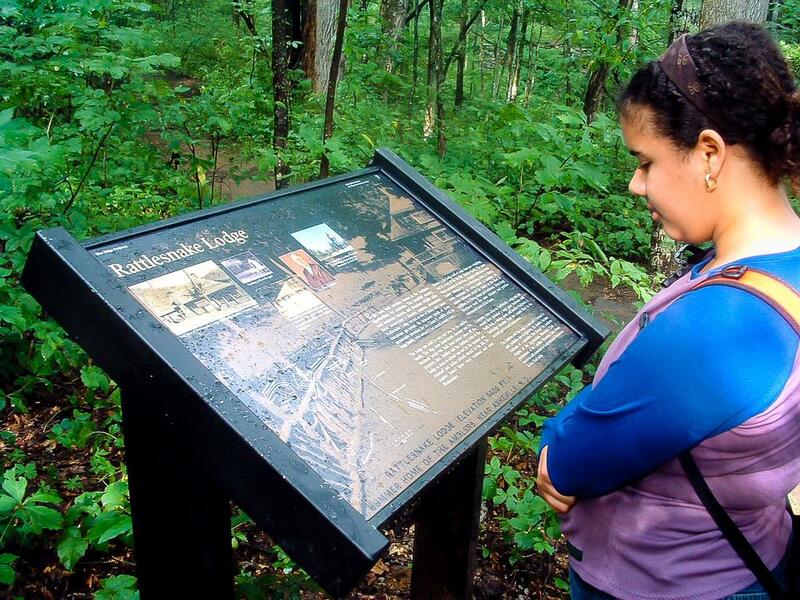 Visit the Rattlesnake Lodge Hike page for more information. 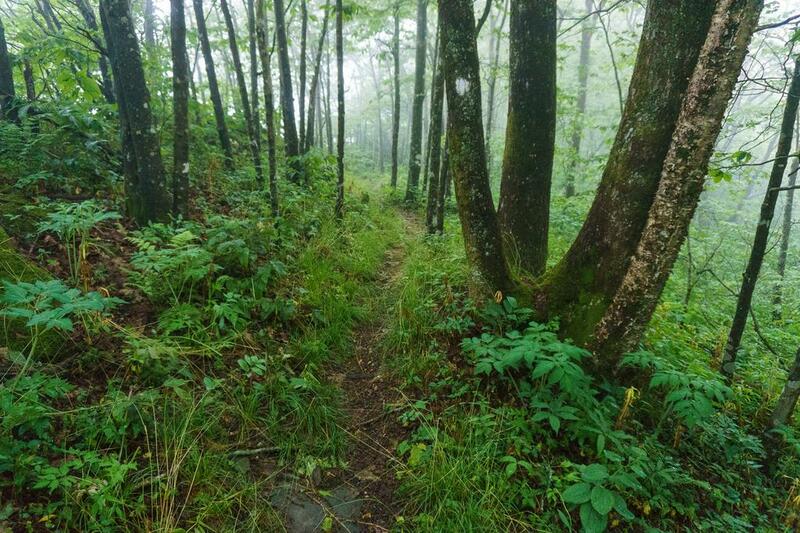 The Rattlesnake Lodge trail is a blue-blazed spur leading up to the Mountains to Sea Trail from the Tanbark Ridge tunnel on the Blue Ridge Parkway. 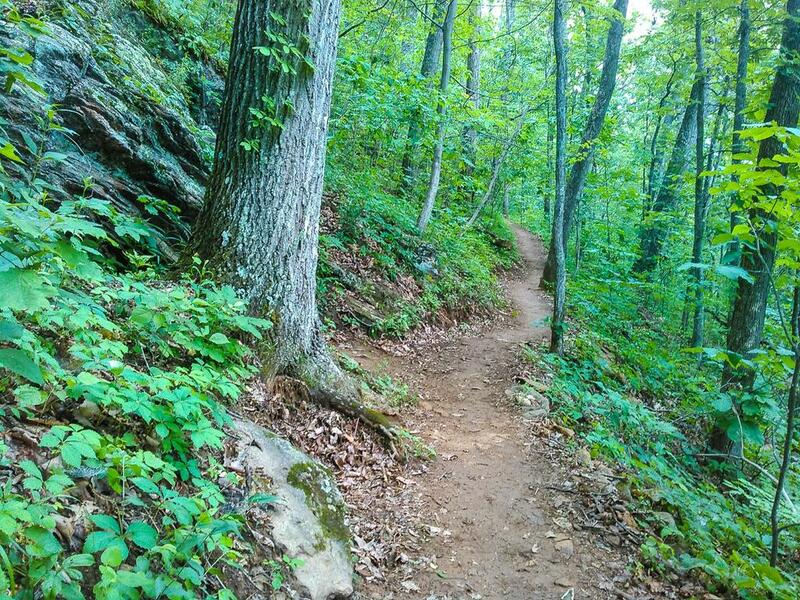 It's a steeper route to reach Rattlesnake Lodge than taking the Mountains to Sea Trail from Bull Gap (which is a highly recommended hike), but a good option if you're short on time. It follows the upper reaches of a fork of Bull Creek with many stepping stones to carry you higher and higher. 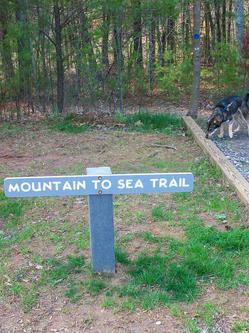 The trail joins the Mountains to Sea Trail at the old lodge site, with ruins located both to the left and right. A sign to the left has a map of the historic site and what you can find there. 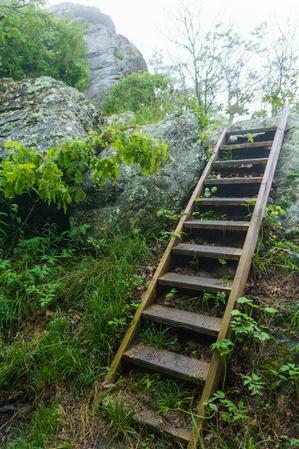 To lengthen this hike by a mile and make a loop, head right on the Mountains to Sea Trail at the top of the steps and follow the white blazes past the chimney at the old caretaker's lodge. 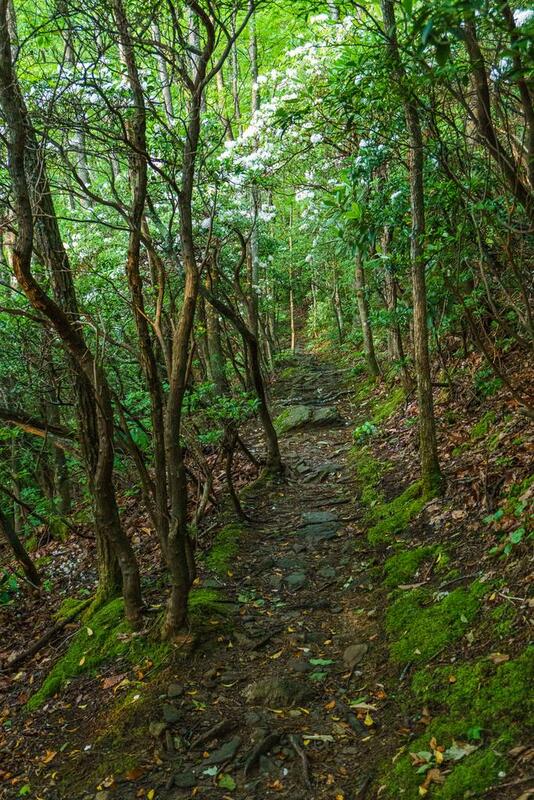 The trail climbs up through a switchback below the summit of High Swan Mountain in a mountain laurel thicket, then gets rocky before a junction with a blue-blazed trail on the left at a spring. The blue-blazed trail descends steeply back downhill, past the old water reservoir, and back to the main lodge site. Return to the parking area via the first segment of blue-blazed trail you hiked up. 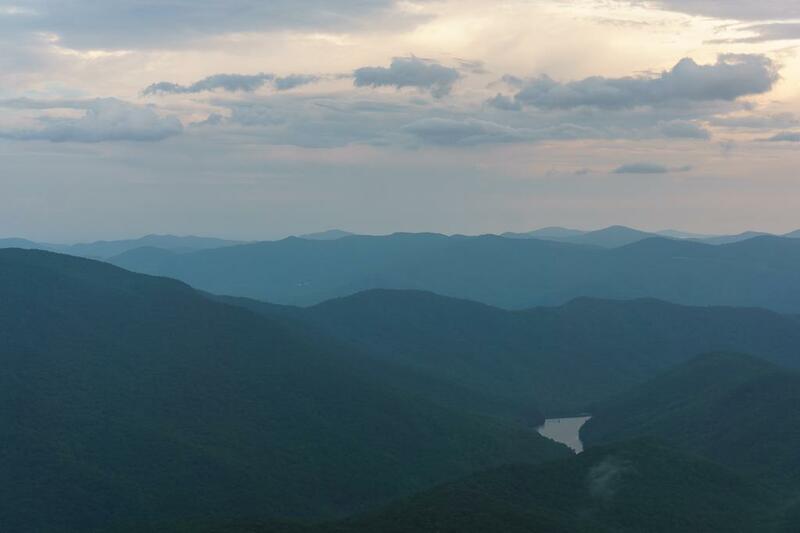 The hike to the summit of Lane Pinnacle on the Mountains to Sea Trail is a relatively challenging one as this list goes, but well worth it for the spectacular scenery along the way. 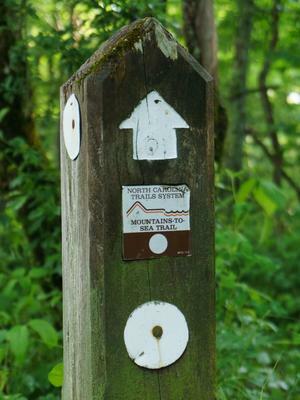 Take the Mountains to Sea Trail south from Beetree Gap, at the junction with Stony Fork Road on the access road up to Craggy Gardens Picnic Area. 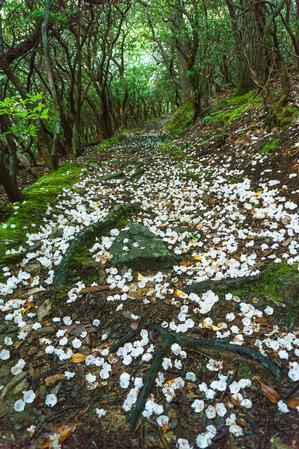 The trail crosses a ridge, then splits left from the Snowball trail (which itself makes another great hike), leading downhill to the Parkway and Potato Field Gap. 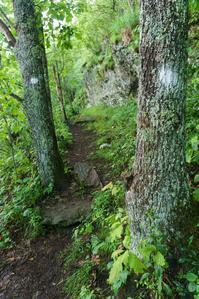 The trail enters the woods at the other side of the gap and begins climbing up the rugged ridge toward Lane Pinnacle. The trail is narrow and climbs up and over rocky knobs, using ladders in places. The trees open up offering views to the south and west in several spots as well. One particularly great view is known as the Raven's Call overlook for the high-elevation birds that can often be heard from there. Forest sections feature gnarly, mossy trees and a lush, green setting with numerous wildflowers (in growing season) and early fall color. The summit of Lane Pinnacle itself is reached after a few ups and downs, and covered by weeds and small trees. Another rock outcrop on the southeast side of Lane Pinnacle offers one last view and marks a good turn-around point for this hike. The Mountains to Sea Trail from the French Broad River up to Mount Pisgah is co-signed as the Shut-in Trail. 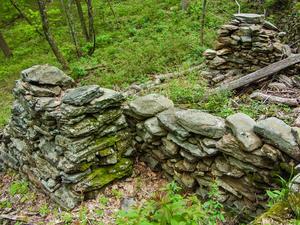 This portion of the MST/Shut-in trail climbs Ferrin Knob on some old road beds. 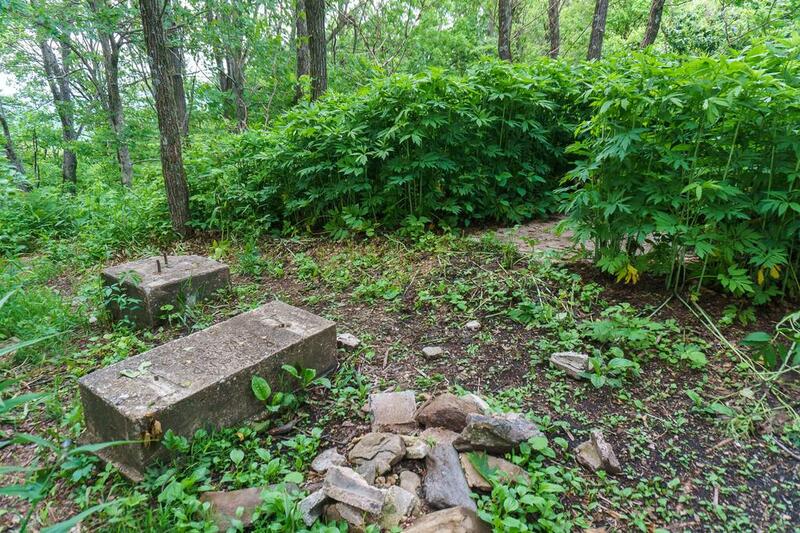 A fire tower once stood atop the knob. Travels through a viney forest filled with wildflowers including wild hydrangea and virginia spiderwort in places, then switches back to reach the ridgeline where the trees become a bit shorter and more gnarly. The old road continues up the ridge to the summit. It's a nice hike for exercise, but there isn't a view at the top (the summit is covered by shrubby trees, vines, and weeds). 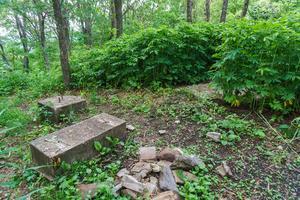 The remains of the old fire tower's foundation can still be seen, however. An overlook and parking area in Sleepy Gap marks another good and popular access point to the MST. 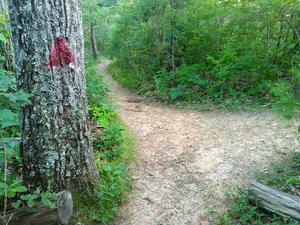 Recommended hikes are both south and north from that access point. The segment of the Mountains to Sea Trail from Sleepy Gap south around Grassy Knob is nearly level with a fairly smooth surface. 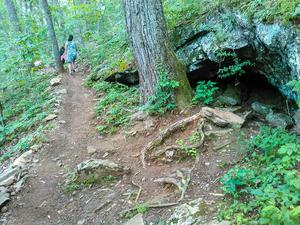 It is also part of the historic Shut-In Trail. From the overlook parking area, take the signed Mountains to Sea/Shut-In Trail to the right. Some side paths go left and right; stay on the level path. It has white blazes. 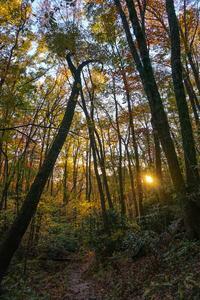 You'll travel around the slopes of Grassy Knob just below the 3000 ft contour. 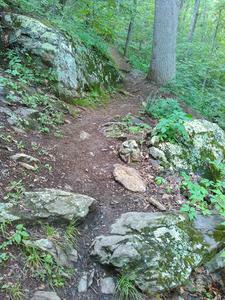 You will find a few rocks, roots, and muddy stretches here and there, but it's nothing to worry about. 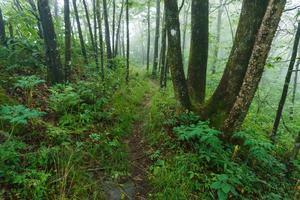 This segment makes an excellent leg-stretcher on a trip up to Mount Pisgah, a quick exercise hike, or a place to bring a camera during spring wildflowers, fall foliage, or fog which enshrouds the laurels at times. There are some large trees intermixed into the lush forest. As you near the Parkway again on the north side of the knob, a large, imposing bluff above the trail shelters a neat, flat cove below the trail. 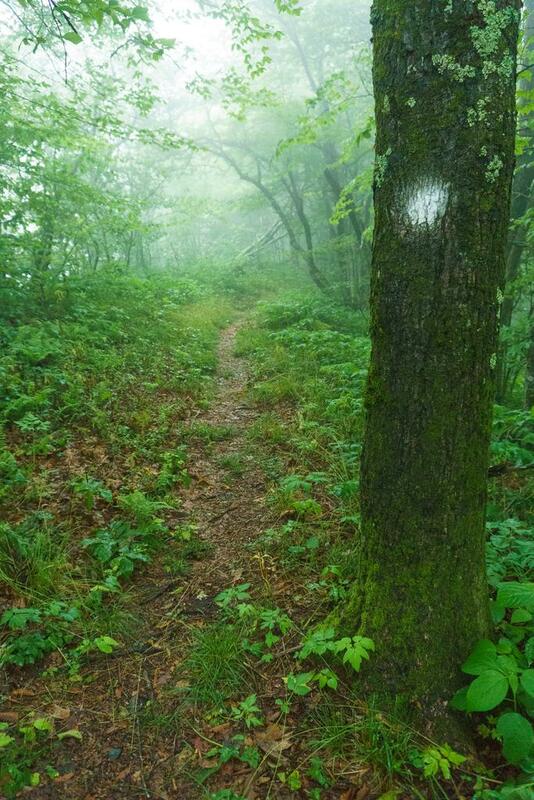 Past this, the trail continues, but starts climbing some more, going about 225 ft up across a small knob and reaching the Chestnut Cove Gap overlook in 1.7 mi. 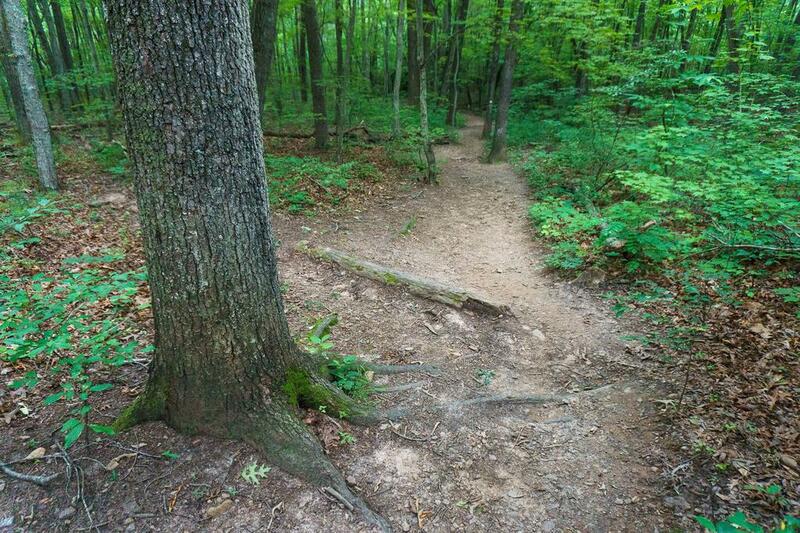 It'll be another 225 ft climb on the way back if you go that far.